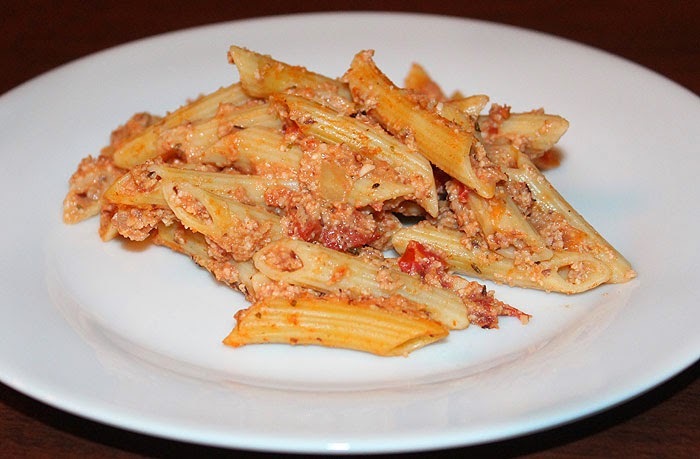 Food Hunter's Guide to Cuisine: Vegan Baked Ziti & A Give Away! Vegan Baked Ziti & A Give Away! Thinking about becoming a vegetarian? My first attempt to do so was in high school. My dad, the chef in our house, was entirely annoyed. A few months later, I was diagnosed anemic and this ended my vegetarian journey . . . at least temporarily. It wasn’t until recently, that a vegetarian approach to eating, once again, found some appeal in my life, particularly after I watched the documentary, Food, Inc. Couple that experience with today’s society that picks up the sword of nutrition in the fierce battle with debilitating disease that exists in our world and it’s easy to lean towards eating more (if not only) vegetables and less meat (if not none). But while I certainly want to win that battle, I don’t want to lose the enjoyment and taste of good food. So, for me, “To eat and what to eat, that is the question.” It’s too bad we can’t script our life screenplay knowing what’s to come. So, while not a vegetarian, I have cut back on my meat and dairy in favor of a lot of vegetarian dishes in what seems like the unending search for ways to improve my nutritional profile while, at the same time, remembering life (and food) is to be enjoyed in balance. That’s what I really liked about Mayim’s Vegan Table cookbook, which provides a very enjoyable transition towards a vegan lifestyle. This book is written by Mayim Bialik, a mother, actress, and neuroscientist, along with Dr. Jay Gordon, a pediatrician. It addresses common misconceptions related to vegan eating, and provides persuasive arguments to adopt a vegan lifestyle for health, environmental, and ethical reasons. Easy meal tips are offered to counter the roadblock of time constraints. And, I must say, many of these recipes are very simple. So, still thinking about becoming a vegetarian? Albert Einstein said, “The world as we have created it is a process of our thinking. It cannot be changed without changing our thinking.” My advice: Try a few recipes and remember that change is gradual, and the transition to a new lifestyle is more successful when implemented gradually, rather than overnight. Even if you don’t plan to ban meat completely, this book will help to set you on the right track to healthier eating. 1. Bring a pot of salted water to boil and cook the pasta according to the package instructions. Drain and rinse, let cool and set aside. 2. To make the herbed “ricotta”, combine the macadamia nuts, ¼ cup of water, and the garlic, salt, and olive oil in a food processor and puree for 1 minute. Scrape down the sides and puree for another minute, until light and fluffy. Set aside. 3. To make the tomato sauce, heat the olive oil in a medium skillet over high heat, and sauté the onion until soft and translucent, about 8 minutes. Add the garlic and herbs and sauté for another 2 minutes. Lower the heat to medium, add the tomatoes and tomato sauce, and simmer for 30 minutes. Add the salt and cook for another 15 minutes. 4. To make the cashew cream, puree the soaked cashews in a blender until a smooth paste forms. Add 1/3 cup of water and the remaining ingredients and puree until creamy. 5. Preheat the oven to 350 F. To assemble the baked ziti, toss the pasta with the tomato sauce in a large bowl, and then stir in the herved “ricotta”. Mix in the cashew cream. 6. Spread into a 9 x 13-inch baking dish, cover with aluminum foil, and bake for 30 minutes, or until the cheese starts to brown. Garnish with fresh basil or parsley, as desired. I am a vegetarian and always looking for new recipes! I would love to see the non big bang theory side to her! the photos that i've seen from this book make the food look phenomenal, so i really want to try them out! I am a beginner vegan and would love some great recipes to try out.